The weather where we live is gorgeous right now, so instead of spending our mornings and afternoons indoors, we've been taking advantage of all the wonderful places to hike and explore close by. My son likes to "hike" but can only handle it for so long. We typically pick mostly flat easy trails (and paved ones too) and set aside an hour in the morning for hiking. Sometimes we even get in an hour in the afternoon too! We bring our jogging stroller and my little guy will walk, run, get carried, or sit in the stroller (or a combo of all four)... depending how he is feeling. Hikes can be just around the neighborhood or to fun new trails. 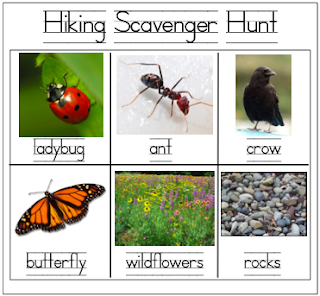 I recently created two activities to do on our "hikes." First I thought about what we usually see on our hikes. Then I designed this card with visuals to show the objects/animals my son is most interested in. I printed out the card and laminated it. When we go hiking we bring a whiteboard marker and some baby wipes. As we find each object/animal, my son draws on the card over the picture (or I cross it out). Once we've found all the objects and have crossed them out, we wipe off the card and start again. We use the crow picture sometimes just for generic birds, hawks, etc. Sometime soon I might make a card just for the birds we see (hawks, blue birds, sea gulls, etc.). If I get motivated I might also poke holes through the edges and tie yarn around the card so that I can wear it like a necklace around my neck as we hike (or my son can). Having a task to do while we are hiking makes exploring a lot more fun! We use this card as a springboard for more conversation and descriptive language about what we see. When we hike we see a lot of colors. I created this card based on the colors that we typically see on our hikes. With older kids I would add more varied colors (light green, olive green, burgundy, etc.). We use this card two different ways. - The first way we use this is by bring a plastic garbage bag, ziploc bag, or brown paper bag with us as we hike. As we find objects that are varying colors, we talk about which color they are and we put them in the bag. When we get home, my son helps me lay out all the objects on the card on top of the correct color circle. We only pick things up that are dead or on the ground... I don't let him pick leaves and flowers off of bushes. is green, we will cross off the green circle using a whiteboard marker. Once we've gotten three across in a row, three down, or three circles diagonally, then we say "BINGO" and we get a little treat from our hiking bag. - Bring some sugary treats! (in addition to some other more healthy items) We usually bring gummy bears, fruit snacks, and granola bars. They are great halfway point snacks to help get everyone's energy back... especially when your toddler starts complaining or you get a little tired! - Find trails that are close to a playground, play structure, or another sort of interesting and new location (big rock, lighthouse, observatory). Hiking to a new playground is way more motivating for a toddler than just hiking aimlessly and exploring. Hiking or just going on short nature walks is such a great way to build language skills! Kids are exposed to so many new textures, sights, and sounds. You can talk constantly... so make sure you take advantage of all the time you have together when you are hiking to TALK about everything! The only colour you are missing on your Colour Bingo is WHITE. 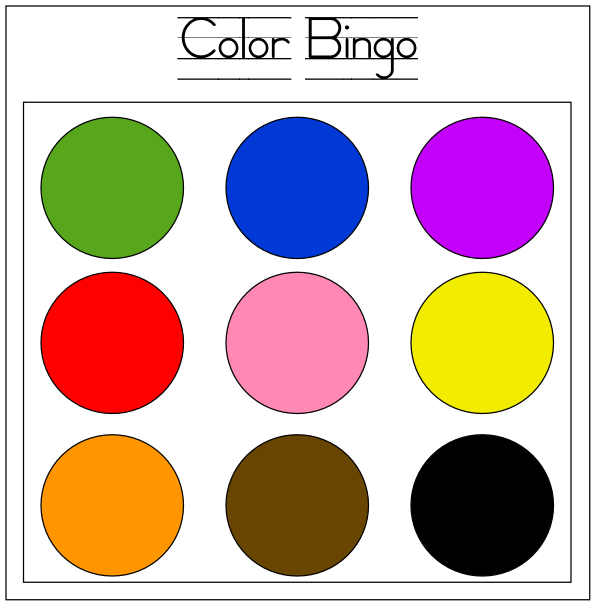 There are 10 basic colours introduced to the toddlers in a Montessori classroom. You have the rest of the colours covered.